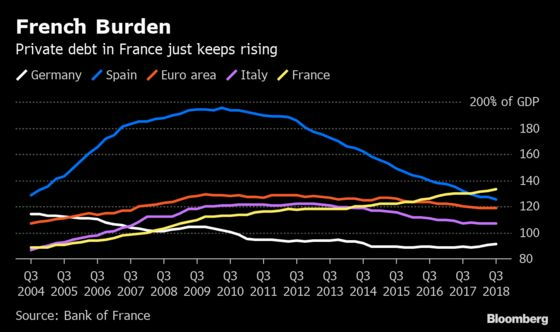 (Bloomberg) -- France’s high and rising private debt burden has worried regulators enough that they are forcing banks to put aside more capital to support lending in a downturn. The country’s High Council for Financial Stability said Monday it will raise the so-called countercyclical capital buffer to 0.5 percent for French exposures from April 2020. The buffer is building more than expected -- regulators told banks last year to prepare to hold 0.25 percent of their assets by July 2019. The move from French regulators is part of a Europe-wide effort to mitigate the possible impact of a long period of low interest rates and rising debt. France is a particularly acute case as debt levels have risen without interruption, while households and businesses in other euro area states have cut back. The buffer is meant to guard against banks’ tendency to boost lending in boom times and cut back in a bust, potentially exacerbating an economic slowdown by denying companies credit when they need it most. It’s designed to be built up when risks are growing, and released during times of stress. The French Banking Federation said the decision to raise the buffer is incomprehensible when the European Central Bank is encouraging lending with expansionary monetary policy, adding that the move also sends a “contradictory signal” at a time when the economy is showing signs of slowing. “French banks don’t understand this decision, which is not coherent with the policy of the ECB,” the lobby group said in a statement. The stability council does not expect the decisions on buffers to affect lending or require banks to raise extra capital, an official at the French finance ministry said in a media briefing on the decision. In its regular review of financial conditions in France, the council said the risk of further volatility remains at a “high level” after markets recovered in recent months from the correction at the end of 2019.